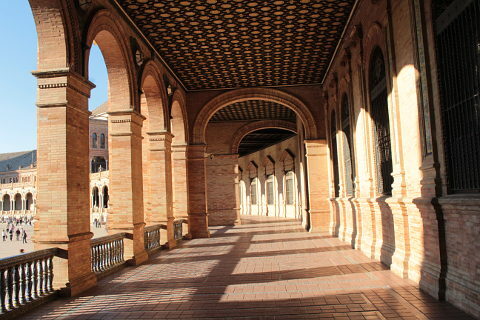 The Plaza de Espana is one of our favourite parts in Seville and during a trip to the town we find ourselves drawn to the Plaza time and again. Particularly nice is an evening visit when the red bricks glow with a deep ochre colour. Despite its ancient appearance the Plaza de Espana was in fact built in 1928 for the 1928 Ibero-American Exposition World Fair. 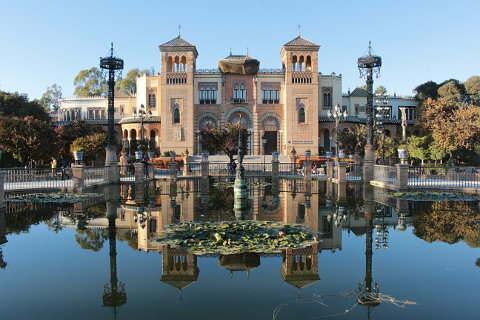 It is set in the Maria Luisa Park along with various other buildings. 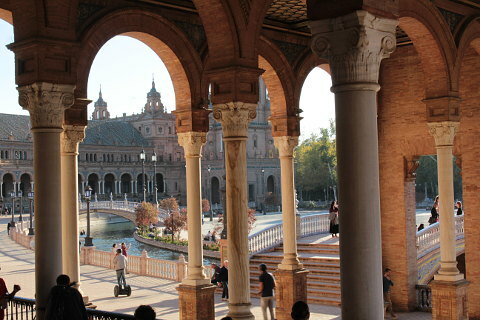 The Plaza was designed by Anibal Gonzalez and combines Art Deco with mock Mudejar and Neo-Mudejar styles. The result is astonishingly beautiful. The Plaza is built in a semi-circular shape with arched alcoves running all along the length. A moat along the lenth is crossed by four beautifully tiled bridges representing the four kingdoms of ancient Spain. 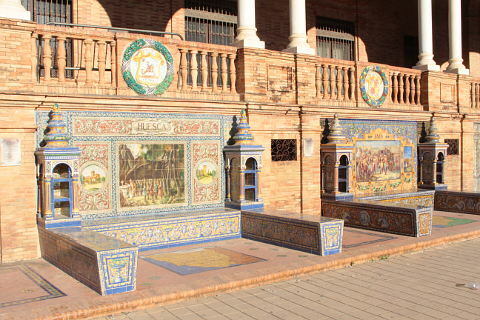 A series of 48 small alcoves run the length of the plaza and each is tiled with a picture representing one of Spain's 48 provinces. Each has a name, map, coat of arms and a representation of some historical event all created in tiles. They really are a treat. Each one is also a bench and so offers a place to sit. 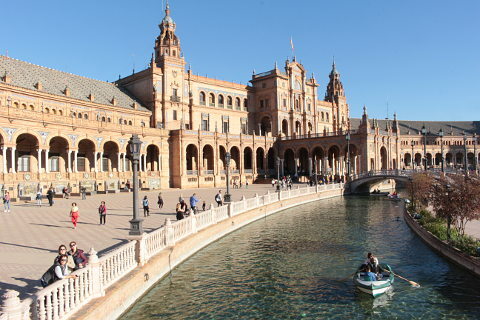 The moat in front of the Plaza de Espana is popular with couples and families as you can hire a boat and row lazily around the semi-circular moat. The buildings are used by government departments but you can go upstairs on to the terraces to get global views over the plaza. The park itself is a pleasant place for a stroll and has been planted with orange trees, palms and pines and you can take a pleasant stroll to the Plaza America on the southern edge of the park. 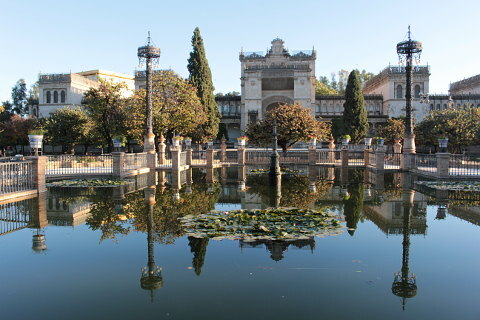 Here, set facing each other across a large pond and prettily planted parterres are the Mudejar Pavillion, the Fine Arts Pavillion and the Royal Pavillion all also designed by Anibal Gonzalez. 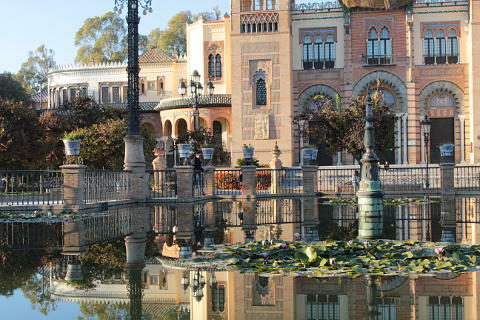 The Mudejar pavillion is now the Museum of Popular Art and Tradition (Museo de Artes Y Costumbres Populares) and displays pottery, embroidery, furniture etc from Seville. It is another very beautiful building especially with its lovely views from across the pond. 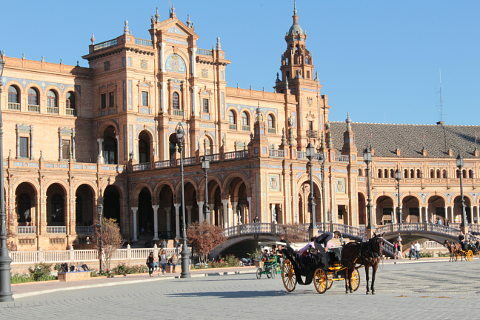 Seville is a fascinating city with lots to see and do. 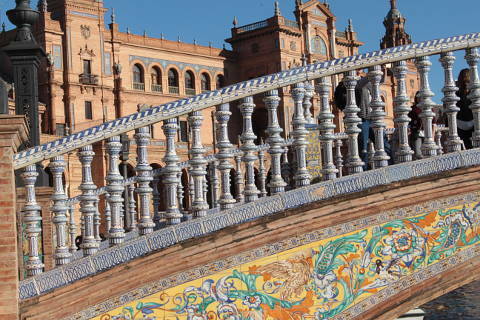 The main sights include the Gothic cathedral, the Giraldi tower with its Mudejar base, the Real Alcazar of Seville, the Metrosol Parasol, the bullring. As well as the key sights it is the beauty of the city in general and its lively atmosphere that are a key draw. Nowhere is this better than the narrow streets of the Santa Cruz district, packed with bars and restaurants. Carmona is a pretty town with plenty to see for a day trip - this can easily be done using the local buses. Ronda is a stunning 'white town' set on the edge of a huge gorge and is also reachable by bus though needs an overnight stay to really get the best of your trip.